Tales sounding as if they came straight out of the Arabian Nights. This is the miraculous story of the blind singer Dona Rosa of Lisbon. Already in the 70s, she turned up in video documentaries as a street singer, accompanying herself only with a triangle in the alleys of Lisbon, where she had long been a local heroine. Then in 1999, André Heller was captivated by her and invited her to appear in the “Voice of God” TV production. This was followed by her debut recording »Historias da Rua« in 2000. Two further CDs followed in 2003 »Segredos« and »Alma Livre« in 2007. 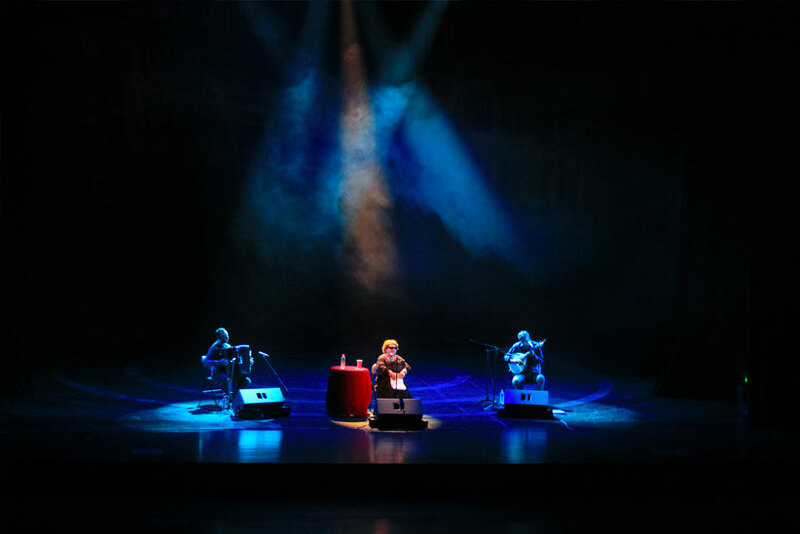 Having achieved notoriety through her appearance in Andre Heller’s music documentary “Voices of God”, Dona Rosa, the blind street singer known to millions for over 20 years from the “Rua Augusta” in Lisbon, has since conquered concert stages of the world from Europe to Taipei and Los Angeles. She is not “just another pretty face”, who in the world of Fado are discovered from year to year. She is rather someone who moves listeners to the depths of their souls. Her latest con- cert program literally plunges us into her world; The first half of the concert is performed in complete darkness; 40 minutes of total submergence in the inner musical consciousness of Dona Rosa. Through this sensory deprivation, one “sees” the music from within, just as Dona Rosa herself experiences it. The second half of the concert presents the exact opposite; All the colors of pulsating life in Lisbon - city upon seven hills - it’s antique charms, it’s hidden lanes brimming with vitality, the favored hangouts of musicians and poets are depicted in this; Dona Rosa’s homage to her home town. As she sings images are projected from „Lisboa“ ( Past & Present, Photos, Text & Musik, ISBN 978-3-9813509-2-0 ), the photo book recently-published in Europe, converting a concert into a multi-media event. The first tour of this new program in Winter 2015/16 in Germany and Austria was completely sold out.